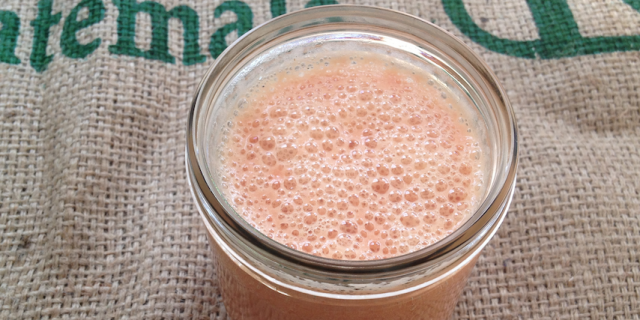 This sweet and delicious Orange Pineapple Ginger Smoothie is another sunny smoothie. Pineapple tastes amazing in smoothies. It has a sweet and exotic flavor, but is also know for its many health benefits. Pineapple is high in vitamin C which can help fight off infections. It also contains bromelain, an enzyme that breaks down protein. It can supports digestive health and aid in digestion. Bromelain is also known for its anti-inflammatory benefits. Pineapple is also a great source the trace mineral manganese, which a component of the antioxidant enzyme superoxide dismutase (SOD), which helps fight free radicals. Free radicals occur naturally in the body but can damage our cell membranes and DNA. They can speed up the aging process and even play a role in the development of many diseases. Add all ingredients to a high-speed blender, pulse until smooth and enjoy your Orange Pineapple Ginger Smoothie.